4. August W. Peterson b. ABT 1863, Norway, m. Wilhelmine (Minnie) Brocker, b. 1873, MI, (daughter of John Brocker and Hannah (Anna) Siekmann) d. 1950, buried: Trinity Lutheran Ch.,Bradyville,New Era. August died 1938, buried: Trinity Lutheran Ch.,Bradyville,New Era. i Hazel A. Peterson b. 15 May 1895. 1. Cora b. ABT 1816, Norway, m. Peter Mutrick, b. ABT 1814, Norway. 2. i Andrew Peterson b. ABT 1855. 3.ii Cornelius Peterson (P.C.) Mutrick b. 1858. 4. iii August W. Peterson b. ABT 1863. 5.iv Hilda Peterson b. ABT 1866, MI. 5. i Alfred C. Peterson b. 1884. 6. ii Mary Carie Peterson b. 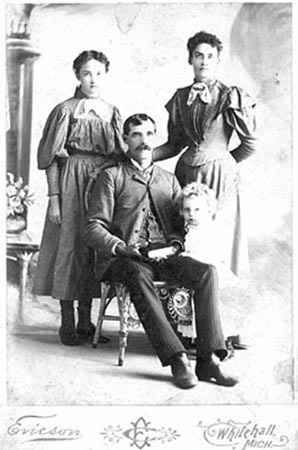 07 Jan 1886.
iii Thomas Peterson b. ABT 1888, Oceana Co.,MI, d. ABT 1976,buried: Trinity Lutheran Ch.,Bradyville,New Era. 7. i Kohn Mutrick b. 03 Jun 1894.
iii Nina Mutrick m. Albert Lewis.